"Obon" redirects here. For the Spanish municipality, see Obón. Participants place candle-lit lanterns in the Sasebo River during Obon. Obon is a shortened form of Ullambana (Japanese: 于蘭盆會 or 盂蘭盆會, urabon'e). It is Sanskrit for "hanging upside down" and implies great suffering. The Japanese believe they should ameliorate the suffering of the "Urabanna". Bon Odori originates from the story of Maha Maudgalyayana (Mokuren), a disciple of the Buddha, who used his supernatural powers to look upon his deceased mother. He discovered she had fallen into the Realm of Hungry Ghosts and was suffering. Greatly disturbed, he went to the Buddha and asked how he could release his mother from this realm. Buddha instructed him to make offerings to the many Buddhist monks who had just completed their summer retreat, on the fifteenth day of the seventh month. The disciple did this and, thus, saw his mother's release. He also began to see the true nature of her past selflessness and the many sacrifices that she had made for him. The disciple, happy because of his mother's release and grateful for his mother's kindness, danced with joy. From this dance of joy comes Bon Odori or "Bon Dance", a time in which ancestors and their sacrifices are remembered and appreciated. See also: Ullambana Sutra. Families sent their ancestors' spirits back to their permanent dwelling place under the guidance of fire: this rite was known as sending fire (Okuribi). Fire also marks the commencement (Mukaebi) as well as the closing of the festival. Bon Odori (Japanese: 盆踊り), meaning simply Bon dance, is a style of dancing performed during Obon. Originally a Nenbutsu folk dance to welcome the spirits of the dead, the style of celebration varies in many aspects from region to region. Each region has a local dance, as well as different music. The music can be songs specifically pertinent to the spiritual message of Obon, or local min'yō folk songs. Consequently, the Bon dance will look and sound different from region to region. Hokkaidō is known for a folk-song known as "Sōran Bushi". The song "Tokyo Ondo" takes its namesake from the capital of Japan. "Gujo Odori" in Gujō in Gifu Prefecture is famous for all night dancing. "Gōshū Ondo" is a folk song from Shiga Prefecture. Residents of the Kansai area will recognize the famous "Kawachi ondo". Tokushima in Shikoku is very famous for its "Awa Odori", and in the far south, one can hear the "Ohara Bushi" of Kagoshima. The way in which the dance is performed is also different in each region, though the typical Bon dance involves people lining up in a circle around a high wooden scaffold made especially for the festival called a yagura. The yagura is usually also the bandstand for the musicians and singers of the Obon music. Some dances proceed clockwise, and some dances proceed counter-clockwise around the yagura. Some dances reverse during the dance, though most do not. At times, people face the yagura and move towards and away from it. Still some dances, such as the Kagoshima Ohara dance, and the Tokushima Awa Odori, simply proceed in a straight line through the streets of the town. The dance of a region can depict the area's history and specialization. For example, the movements of the dance of the Tankō Bushi (the "coal mining song") of old Miike Mine in Kyushu show the movements of miners, i.e. digging, cart pushing, lantern hanging, etc. ; the above-mentioned Soran Bushi mimics the work of fishermen such as hauling in the nets. All dancers perform the same dance sequence in unison. There are other ways in which a regional Bon dance can vary. Some dances involve the use of different kinds of fans, others involve the use of small towels called tenugui which may have colourful designs. Some require the use of small wooden clappers, or "kachi-kachi" during the dance. The "Hanagasa Odori" of Yamagata is performed with a straw hat that has been decorated with flowers. The music that is played during the Bon dance is not limited to Obon music and min'yō; some modern enka hits and kids' tunes written to the beat of the "ondo" are also used to dance to during Obon season. The Bon dance performed in the Okinawa Islands is known as eisā. Similarly, the Yaeyama Islands have Angama. In Argentina, the Bon Festival is celebrated by Japanese communities during the summer of the southern hemisphere. The biggest festival is held in Colonia Urquiza, in La Plata. It takes place on the sports ground of the La Plata Japanese School. The festival also includes taiko shows and typical dances. Bon Odori Festival is celebrated every year in many Japanese communities all over Brazil, as Brazil is home to the largest Japanese population outside Japan. São Paulo is the main city of the Japanese community in Brazil, and also features the major festival in Brazil, with street odori dancing and matsuri dance. It also features Taiko and Shamisen contests. And of course, this festival is also a unique experience of a variety of Japanese food & drinks, art and dance. The Korean version of the Bon celebration is known as Baekjung. Participants present offerings at Buddhist shrines and temples, and masked dances are performed. It is as much an agricultural festival as a religious one. In Malaysia, Bon Odori Festivals are also celebrated every year in Esplanade, Penang, Shah Alam Stadium in Shah Alam, Selangor, and also Universiti Malaysia Sabah at Kota Kinabalu, Sabah. This celebration, which is a major attraction for the state of Selangor, is the brain child of the Japanese Expatriate & Immigrant's Society in Malaysia. In comparison to the celebrations in Japan, the festival is celebrated on a much smaller scale in Penang, Selangor and Sabah, and is less associated with Buddhism and more with Japanese culture. Held mainly to expose locals to a part of Japanese culture, the festival provides the experience of a variety of Japanese food and drinks, art and dance, with the vast number of Japanese companies in Malaysia taking part to promote their products. Bon Odori festivals are also celebrated in North America, particularly by Japanese-Americans or Japanese-Canadians affiliated with Buddhist temples and organizations. Buddhist Churches of America (BCA) temples in the U.S. typically celebrate Bon Odori with both religious Obon observances and traditional Bon Odori dancing around a yagura. Many temples also concurrently hold a cultural and food bazaar providing a variety of cuisine and art, also to display features of Japanese culture and Japanese-American history. Performances of taiko by both amateur and professional groups have recently become a popular feature of Bon Odori festivals. Bon Odori festivals are usually scheduled anytime between July and September. Bon Odori melodies are also similar to those in Japan; for example, the dance Tankō Bushi from Kyushu is also performed in the U.S. In California, due to the diffusion of Japanese immigration, Bon Odori dances also differ from Northern to Southern California, and some are influenced by American culture, such as "Baseball Ondo". 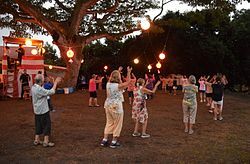 Even Ke'ei, a remote place,  on the western side of Hawaii, comes alive when bon dance is held under the monkey pod tree of the Buddhist mission & cemetery every August. Some Japanese museums may also hold Obon festivals, such as the Morikami Japanese Museum in Florida. In St. Louis Missouri the Botanical Garden has hosted a Bon festival over Labor Day weekend every year since 1977. Known as the Japanese festival it is a collaboration with several Japanese-American organizations. Hosting thousands of people over 3 days it provides authentic Japanese music, art, dance, food, and entertainment including dancing around a yagura, sumo wrestling, Taiko drums, Bonsai demonstrations, music played on traditional instruments, several bazaars, food courts with authentic Japanese foods, tea ceremonies, candlelit lanterns released on the lake in the gardens Japanese garden and much more. It is also celebrated in the country of Taiwan, because of their Chinese influence and roots. Ghost Festival, the Chinese counterpart of the Bon Festival. ^ Bon A-B-C, 2002, Bonodori.net, Japan, http://www.bonodori.net/E/sekai/bonabc3.HTML Archived 2012-03-15 at WebCite. ^ Chen, K 1968, ‘Filial Piety in Chinese Buddhism’, Harvard Journal of Asiatic Studies, p88. ^ What is Obon, 1998, Shingon Buddhist International Institute, California, http://www.shingon.org/library/archive/Obon.html. ^ Obon: Japanese festival of the dead, 2000, Asia Society, http://www.asiasource.org/news/at_mp_02.cfm?newsid=27391 Archived 2008-03-02 at the Wayback Machine. ^ HUR, Nam-Lin. Death and Social Order in Tokugawa Japan: Buddhism, Anti-Christianity, and the Danka System. Harvard University Asia Center, 2007. p. 192. ISBN 9780674025035. ^ "Una tradición que se afirma en la Ciudad", El Día, Sunday, January 9, 2010. ^ MobileReference (2007). Encyclopedia of Observances, Holidays and Celebrations from MobileReference. MobileReference. p. 490. ISBN 978-1-60501-177-6. Retrieved 2 April 2013. ^ Dong-Il Cho (2005). Korean Mask Dance. Ewha Womans University Press. p. 49. ISBN 978-89-7300-641-0. Retrieved 2 April 2013. ^ "Keei Beach: Kona's Best-Kept Secret - Hawaii.com". hawaii.com. Retrieved 18 March 2018. ^ "Hawai'i Summer 2016 Bon Dance Schedule". honolulumagazine.com. Retrieved 18 March 2018. ^ "2016 Obon season calendar". staradvertiser.com. 29 May 2016. Retrieved 18 March 2018. ^ warubozu047 (23 December 2010). "Fukushima Ondo (福島音頭)". Retrieved 18 March 2018 – via YouTube. ^ "Lantern Festival: In The Spirit Of Obon – Morikami Museum and Japanese Gardens". 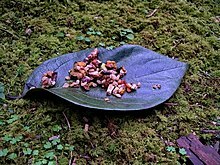 morikami.org. Retrieved 18 March 2018. 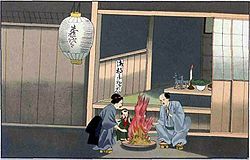 Look up Obon in Wiktionary, the free dictionary. Wikimedia Commons has media related to Bon Festival.